This lovely country property has been refurbished to a good standard and is perfectly habitable and ready to live in. The current owners have fitted a new kitchen and bathroom and have fitted double glazing throughout. There is land all around and a spectacular swimming pool with patio around it which is to the back of the property, making it nice and private. When entering the property via the front door we enter via the living room which is a good size and has lots of natural light. To the left there are two bedrooms, both good sizes, perfectly big enough for double beds. Off of the living room we have the kitchen. It has plenty of worktop space and has a door out to the garden. Down the stairs there is a further two bedrooms both of which can fit double beds. On this floor is where the family bathroom is which has a bathtub and a separate shower cubicle so it’s a good enough size. Also on this floor is a laundry room with access to the exterior. To the outside, the property has land wrapping around it with trees to the back. As mentioned earlier, the property has a nice swimming pool with patio around it to the back of the house, so it is completely private. At the moment there is plenty of off road parking but no garage but there is plenty of space to build a wooden shed or lean to. 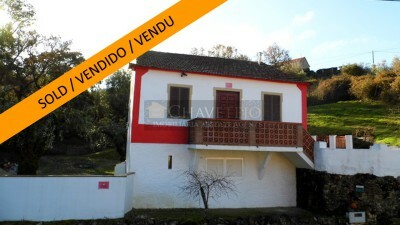 The property is located near to the village of Chãos. Chaos has a café, mini market a doctor, post office, pharmacy and a weekly fresh and local produce market.